View of the Hoof Wall and Coffin Bone. Image Copyright Tufts University. A 14 year-old Dutch Warmblood gelding presented for the evaluation of bilateral (both-sided) forelimb laminitis, first diagnosed by the attending veterinarian two months earlier. At the time of onset, the horse was treated with flunixin, acepromazine, DMSO and icing of the feet, which brought an improvement in soundness. However, a significant worsening of lameness ensued five days prior to presentation at the Hospital for Large Animals at Cummings Veterinary Medical Center. The referring veterinarian’s radiographs confirmed coffin bone rotation relative to the anterior hoof walls of both front feet. 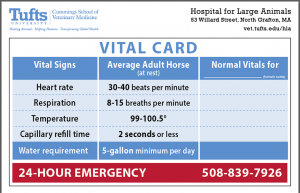 Upon presentation to the Hospital for Large Animals, the horse had normal vital parameters (temperature, heart and respiratory rate, digital pulses). He was wearing egg-bar shoes and flat pads, each shoe possessing four studs to aid traction during the winter season. At the trot, a shortened stride in both forelimbs with a consistent 2/5 lameness (0 = not lame, 5 = non-weight bearing lameness) in the left fore was noted. The horse was not sensitive to hoof testers. He had a body condition score of 6 (moderately fleshy) and a firm, crested neck. Plain radiographs and venograms of both front feet were completed. 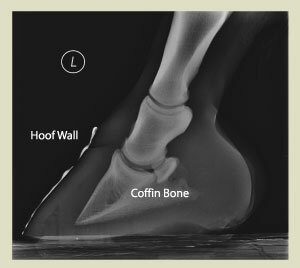 The plain radiographs confirmed 7º (right) and 8.5º (left) rotation of the coffin bone relative to the (anterior) hoof wall, as seen in the picture above. A small volume of dye has leaked from the vessels at the dorso-distal extent of the left coffin bone, consistent with mild damage. Image Copyright Tufts University. Both hooves had relatively long toes and moderately thin soles for the size of horse. Venograms (contrast injected into blood vessels of the feet) revealed generally good perfusion of the entire digital vasculature. 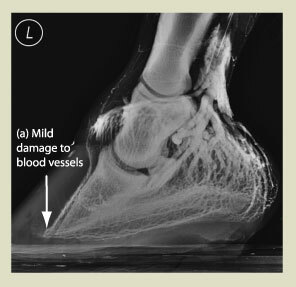 The circumflex vessels of both hooves were mildly displaced and a small volume of dye had leaked from the vessels at the dorso-distal extent of the left coffin bone (Image 2; a), both signs consistent with mild damage. Fasting blood work performed prior to admission revealed elevated insulin (102 µU/mL; normal 5-20) and normal glucose (94 mg/dL; normal 60-125), indicative of insulin resistance. Based on the horse’s clinical findings and his moderately fleshy body condition score, long-standing forelimb laminitis and associated equine metabolic syndrome were provisionally diagnosed. Initial management was directed at mechanically optimizing the orientation and shape of both fore-feet to minimize further rotation, maximize blood supply to all hoof structures and promote sole growth. The toes of both forefeet were shortened by ~1.0-cm and wide-web 3º-wedge aluminum shoes (Trac-me®) with a rolled toe were applied in conjunction with polymeric putty supporting the frog and caudal (back) ⅔ of the sole under synthetic pads. The horse was kept at the hospital for 24 hours post-shoeing to assess his response. Immediately prior to discharge his left forelimb lameness was undetectable although he retained a mildly shorter than normal gait in both front feet. At least four weeks of stall rest and hand walking or small enclosure turn-out were advised to be followed by reassessment. To address the metabolic syndrome, the amount of hay fed was reduced by half with instructions to feed it in small quantities throughout the day. Because the amount of non-structural carbohydrates in the hay was unknown, the owners were instructed to soak the hay in cold water for 30 minutes and drain for 15 minutes prior to being fed. Hopefully this would decrease the amount of carbohydrates in the hay to a level that would not raise the horse’s insulin. Clinical Case Challenge – A 14 year-old Dutch Warmblood gelding presented for the evaluation of bilateral (both-sided) forelimb laminitis, first diagnosed by the attending veterinarian two months earlier. Read on for the answers and further detail. VetPD to Return for EMS/PPID Course. 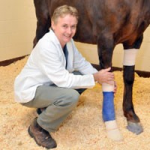 After a successful conference in April, VetPD will be back at the Cummings School Campus in the fall to deliver a groundbreaking course on Determining the cause of Laminitis—A Practical Approach to Diagnosing & Managing EMS/PPID Cases. The Hospital for Large Animals’ Dr. Nick Frank and Dr. Melissa Restifo will be featured clinicians. October 24-25, 2015 – Register Now. We are in the midst of developing for our winter lecture series exclusively for area DVMs and we want to know…what would you like to learn about? Send your suggestions to vetceinfo@tufts.edu. Have you heard the news? 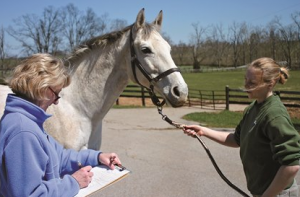 The 2015 American Horse Publications (AHP) Equine Industry Survey is complete and preliminary results paint a positive picture for both veterinarians and the industry. Over 11,000 horse owners weighed in on topics ranging from vaccinations and deworming to the industry’s biggest challenges. In these dog days of summer, it is essential for horse owners to keep a watchful eye on their animal’s vital signs to ensure that they are healthy and happy. 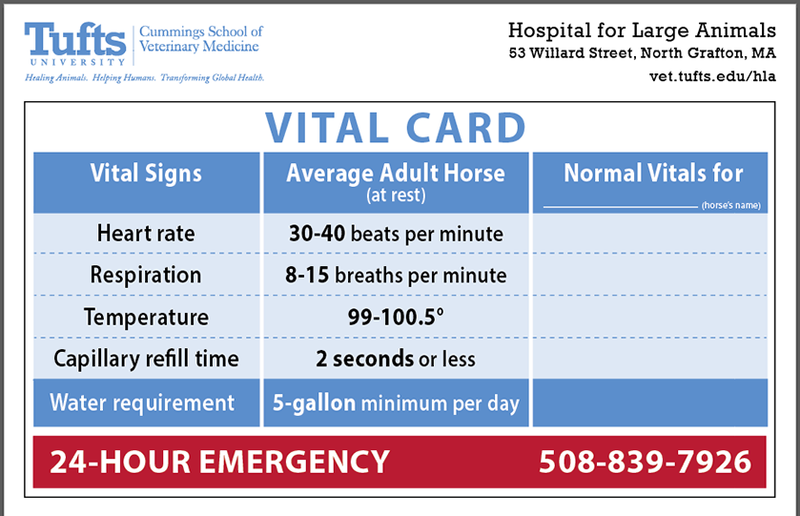 Make sure your clients know what is normal and what is not with this printable vital card. This article appeared in the August 2015 issue of our email newsletter – Progress Notes. Sign up for the newsletter and receive information on timely topics featuring our experts at Hospital for Large Animals.